Well, winter has finally arrived and it’s too cold to actually work on the boat. Time to do some planning and design inside where it’s warm. When we acquired Daydream, it had no sanitation system aboard. There were two seacocks installed, one for water inlet and one for overboard discharge, in the head compartment but nothing else. We wanted to spend weekends aboard and do some short cruises with her. A porta-pottie was an option, but neither my daughter nor I was enamored of the idea of lugging a tank full of “stuff” and dumping it. Space and complexity were also issues. It is a 26 foot boat after all, and space is at a premium. While the weather was still warm, I did manage to remove the old thru-hulls and seacocks. As you can see from the pictures, the old valves were gate valves. These types of valves have no place aboard a boat. 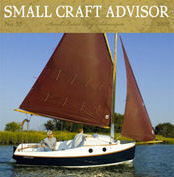 They don’t meet ABYC (American Boat and Yacht Council) specifications and are, in fact dangerous. There is no way of telling, by looking at the valve, if it is open or closed and they are prone to jamming, open or closed. The handles and shafts are also likely to corrode. "The first half of any project takes at least ninety percent of the resources -- time, money, materials, patience and everything else. The second half of the project takes at least another ninety percent of the resources originally available. The third half of the project will require even more. " My usual method of removing thru-hulls is to use stacked hole saws on a common drill bit. The smaller, inner hole saw fits inside the thru-hull opening and centers the larger outside hole saw. The larger hole saw is the same diameter of the threaded part of the thru-hull and cuts through the flange, releasing the thru-hull from the hull. It turned out that the right size hole saw was dull from cutting fiberglass on another project. The batteries for my drill were also weak. Plan B was to cut the flange off with a fiber-reinforced cutting disc in my Dremel tool, another favorite tool combination. After a couple of minutes the Dremel catastrophically deconstructed itself. Plan C was to laboriously grind off the flange with my 4-inch angle grinder. Success at last. Since I didn’t want a porta-pottie, I would need to install a marine toilet and a holding tank. Given that we probably wouldn’t be using the boat outside of the Chesapeake Bay, provision for overboard discharge was eliminated. I could have placed the holding tank under the v-berth, in place of the old water tank my daughter had removed, but that would mean longer plumbing runs and difficult access for vent and pump out lines. The existing head compartment has a cabinet up against the hull with several shelves. After measuring it and taking a quick look at a holding tank catalog, it appeared I could install a reasonably sized holding tank in place of the cabinet. This is where my computer proved extremely useful. I use an inexpensive CAD (Computer Aided Design) program to do all the illustrations for my articles. I carefully measured the head compartment and the cabinet size and entered those dimensions into the computer. I could then take the dimensions of various holding tanks from my catalog and enter them into the same computer-based drawing. I could rotate each sample tank various ways and overlay it on the cabinet dimensions for a trial fit. That allowed me to find the maximum tank size I could fit into the available space while still allowing room for hoses and fittings. If you don’t have a CAD program available, you can accomplish the same result using graph paper. Make a scale layout of the head compartment on the graph paper. Make scale cut pits of the various tanks and place them on the graph paper to verify tank sizes and placement. It takes a little longer but works just as well. Spend the time on this planning phase and save aggravation later when you pick the wrong size tank. The final choice was a rectangular 13 gallon holding tank. Normally this tank is placed horizontally with the fittings on one end. I could fit this tank in if I installed it on its side with the openings for the fittings on the top. This worked fine for the inlet and the vent line. To allow for pumping the tank, I would have to install a new fitting at the bottom of the tank, but fitting relocation kits are readily available and not difficult to install. The final design included a standard manual marine toilet. If you watch for sales, they can be purchased for as little as $100. The toilet would require flushing water. That will come from a new 3/4” thru-hull/seacock installed in the existing opening. The output of the toilet will go to an inlet on the (now) top of the tank. Two PVC elbows, a short piece of PVC pipe and a threaded pipe bard will cut down the length of the hose required. The outlet of the tank will be plumbed directly to the pump out fitting in the port deck, I eliminated the overboard discharge option so I will be patching the existing hole in the hull as soon as warmer weather returns. The tank vent line also goes from the top of the tank to a thru-hull to be added just below the toe rail. The tank I picked had two 1-1/2” openings and one ½”opening for a vent. I am only using one of the 1-1/2” openings for the tank inlet line. The other will have to be plugged with a PVC pipe plug. I do have another option. Peggy Peel, a noted marine sanitation specialist, recommends larger vent lines than are common. Her rational is that the organisms that make holding tanks smell are anaerobic bacteria, i.e. ones that thrive in the absence of oxygen. If the tank is well vented, these organisms are supplanted with aerobic bacteria and the odor goes away. Therefore I could use that extra 1-1/2” opening and install a larger vent line, say one inch or so. I’m still thinking about that option. In the meantime, the design is finished and the equipment list is ready. Time to start looking for some great deals on boat parts while waiting for the weather to get warm. The gate valve in place below the cabinet that will house the holding tank. The pesky gate valves removed at last. Location of the outlet thru-hull, soon to be patched. The scale drawing of the side view of the head compartment. Checking the location and size of a prospective holding tank. The final sanitation system design. Quality equipment plus impressive design. Health security is very important. Thanks for sharing your project daydream. Health security is very important. Dirty water can caused many illnesses. Planning and designing this such amazing sanitation system would be very helpful to your families and to the community as well. You can get several diseases due to dirty water. Installing a sanitation system may take quite some time, but it guarantees safe water for your home. Studying this project design can actually allow you to devise a DIY sanitation system for your home.